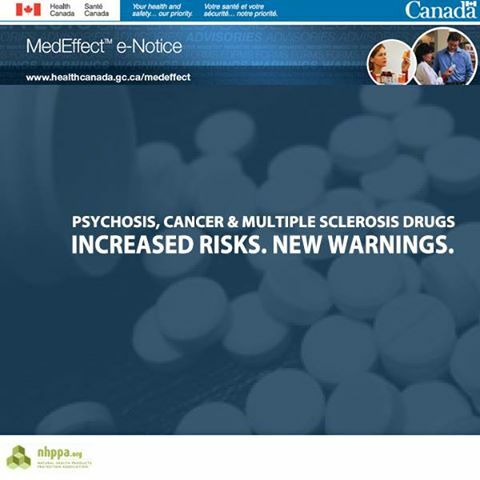 After reading Dr. Rona’s recent article in Vitality Magazine, we took a look at a few of Health Canada’s MedEffect e-Notices for drugs with severe risks from last fall. They indicate serious side effects that are being updated on labels. These are all good reminders that personal choice in how we want to treat our health conditions, needs to be an overarching principle. As a supporter of NHPPA, it’s likely you have discovered Natural Health Products that work for you. Do any of them come with these kinds of warnings? Clinical trials, the standard to which mainstream medicine proponents hold their position, are used to generate data on “safety and efficacy” to get drugs to market. Trials don’t represent all outcomes. Many are unknown. The antipsychotic drug Abilify, made by Otsuka America and Bristol-Myers Squibb, has had to update their label with a warning of “increased risk of impulsive behaviours of pathological gambling and hypersexuality”. We are reminded of an article published in HANS Magazine Fall 2011 by Shawn Buckley, LLB: “Federal Double Standard – If we cannot harm people without legal consequences, why are Health Canada employees allowed to?” It points out that Health Canada can remove natural health products from the shelves for various reasons with no regard for people who depend on them for their health and well-being. Yet some of the most dangerous pharmaceutical drugs are sold and used with known serious risks including death.